Continuing on SQL Server on Amazon Web Services RDS journey that I started on previous post. In that post I covered basics of RDS, creating SQL Server instance in RDS and connecting to it. In this post I would like to cover additional topics that are near and dear to any RDBMS DBA, including backups\restores, HADR and talk about limitations of SQL Server on RDS. You only get SQL Server basic RDBMS Engine Services. SQL Server comes in with large number of components in addition to basic database services, These include Analysis, Reporting and Integration Services, Master Data Services, Distributed Relay, etc. 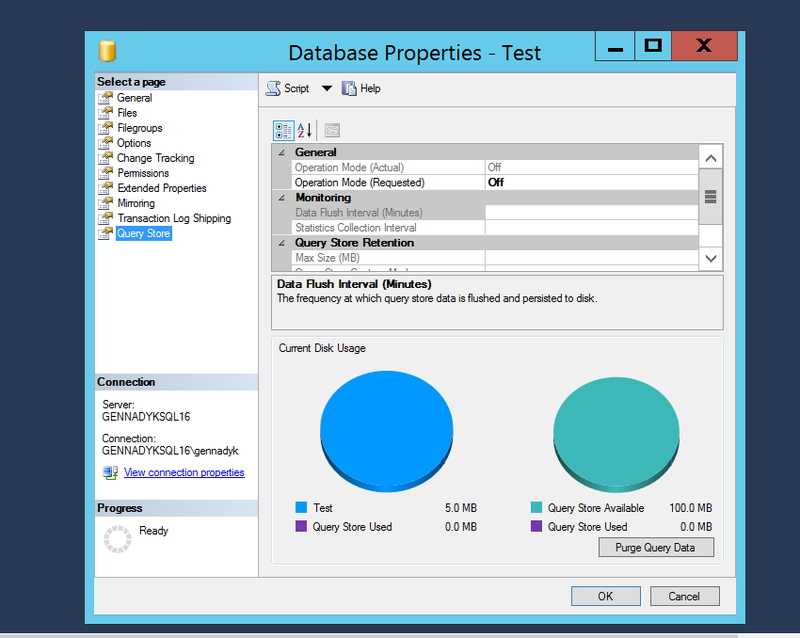 As you setup SQL Server on premises you pick components that you need. 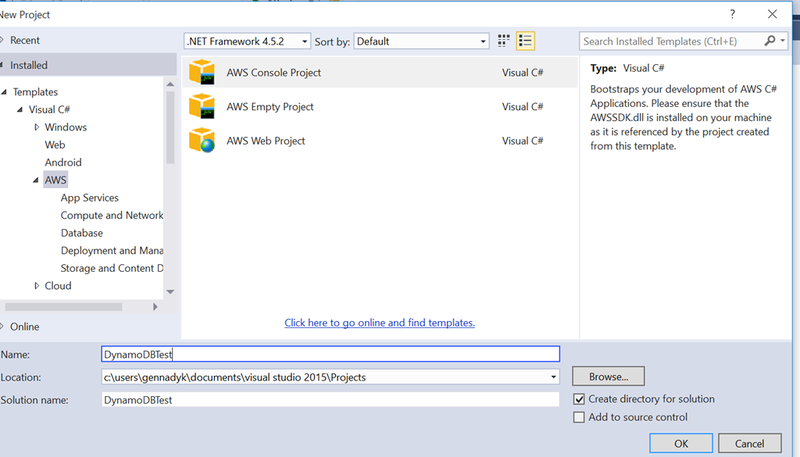 With RDS all you can host is DB Engine Service, So if your application architecture involves running SQL Server instances with SSAS or SSRS, those components will have to be hosted elsewhere: this can be either an on-premise server within your network or an EC2 instance in the Amazon cloud. As an architectural best practice, it would make sense to host them in EC2. 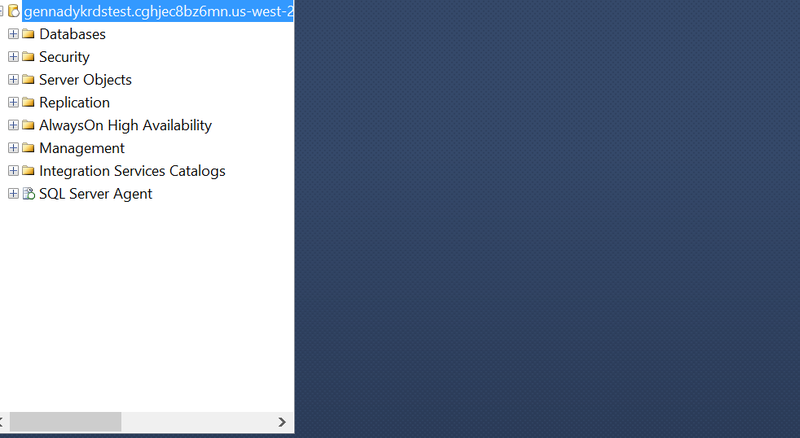 Although you can login from SQL Management Studio (SSMS) there is no Remote Desktop option available that I could find. Size limitations. 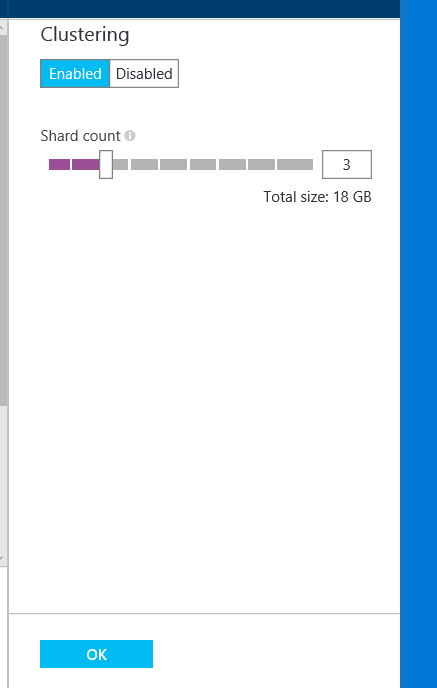 AFAIK the minimum size of a SQL Server RDS instance for Standard or Enterprise Edition is 200 GB.and max is 4 TB. Beyond 4 TB you would have create another instance and probably implement some sort of sharding methodology. Another limitation to be aware of is the number of SQL Server databases an RDS instance can host. It’s only 30 per instance. There are no high availability options available. So no replication, no log shipping, no AlwaysOn and no manual configuration of database mirroring. Mirroring is enabled for all databases if you are opting for a Multi-AZ rollout. The secondary replica hosts the mirrored databases. No FileStream, CDC, SQL Audit , Policy Based Management, etc. So if I have no AlwaysOn Availability Groups or cluster how would HADR work? 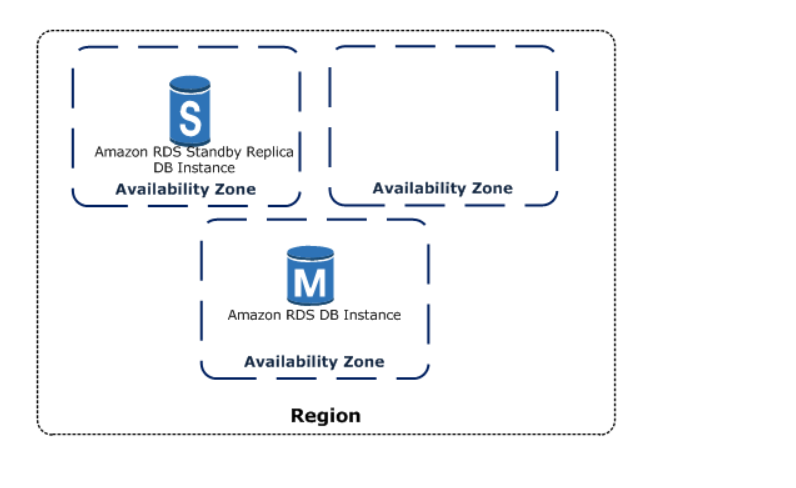 Amazon RDS provides high availability and failover support for DB instances using Multi-AZ deployments. Multi-AZ deployments for Oracle, PostgreSQL, MySQL, and MariaDB DB instances use Amazon technology, while SQL Server DB instances use SQL Server Mirroring. In a Multi-AZ deployment, Amazon RDS automatically provisions and maintains a synchronous standby replica in a different Availability Zone. The primary DB instance is synchronously replicated across Availability Zones to a standby replica to provide data redundancy, eliminate I/O freezes, and minimize latency spikes during system backups. The RDS console shows the Availability Zone of the standby replica (called the secondary AZ), or you can use the command rds-describe-db-instances or the API action DescribeDBInstances to find the secondary AZ. When using the BYOL licensing model, you must have a license for both the primary instance and the standby replica. In the event of a planned or unplanned outage of your DB instance, Amazon RDS automatically switches to a standby replica in another Availability Zone if you have enabled Multi-AZ. The time it takes for the failover to complete depends on the database activity and other conditions at the time the primary DB instance became unavailable. Failover times are typically 60-120 seconds. However, large transactions or a lengthy recovery process can increase failover time. The failover mechanism automatically changes the DNS record of the DB instance to point to the standby DB instance. 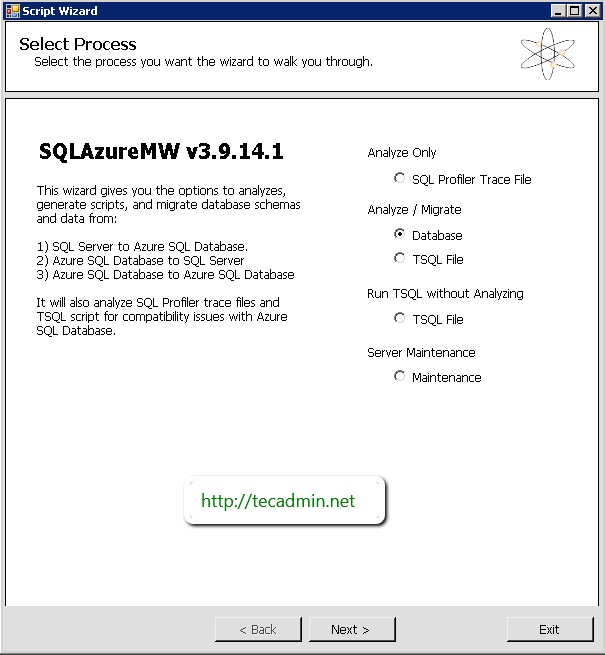 Interestingly you can also use SQLAzureMW tool http://sqlazuremw.codeplex.com/ to move schema and data from SQL Server to RDS. Then you connect to destination and transfer schema and data: To me that’s much easier than scripting and transferring schema and using bcp separately on data. 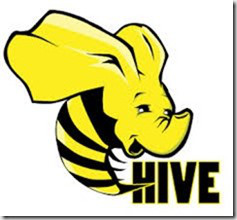 In my previous post some time ago I introduced Apache Hive technology on Hadoop. Coming from SQL and RDBMS this was bound to be my favorite Hadoop technology. Apache Hive is an open-source data warehouse system for querying and analyzing large datasets stored in HDFS files. Today, unlike previous basics post, I will concentrate on Hive Partitions and Buckets. A simple query in Hive reads the entire dataset even if we have where clause filter. This becomes a bottleneck for running MapReduce jobs over a large table. We can overcome this issue by implementing partitions in Hive. Hive makes it very easy to implement partitions by using the automatic partition scheme when the table is created. 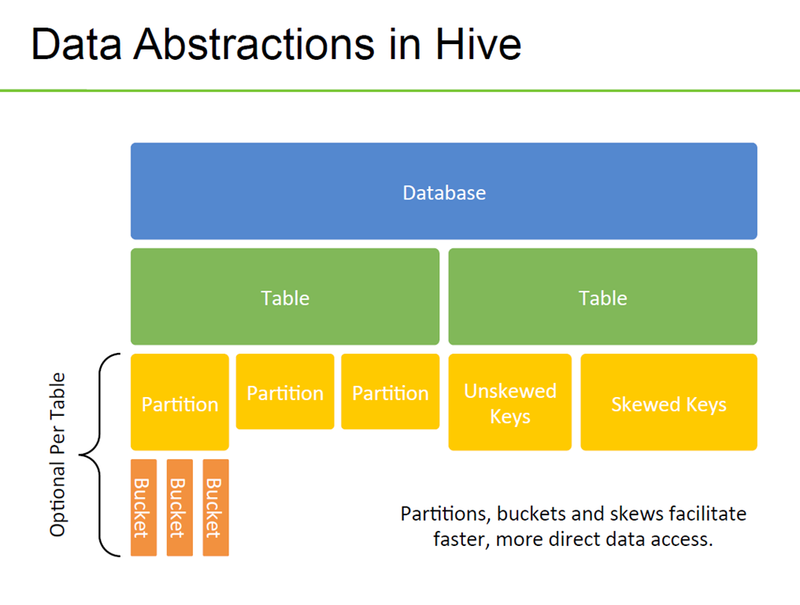 When a partitioned table is queried with one or both partition columns in criteria or in the WHERE clause, what Hive effectively does is partition elimination by scanning only those data directories that are needed. If no partitioned columns are used, then all the directories are scanned (full table scan) and partitioning will not have any effect. Buckets. Much like partitioning, bucketing is a technique that allows you to cluster or segment large sets of data to optimize query performance. As you create HIVE table you can use CLUSTERED keyword to define buckets. The basic building block of Amazon RDS is the DB instance. A DB instance is an isolated database environment in the cloud. A DB instance can contain multiple user-created databases, and you can access it by using the same tools and applications that you use with a stand-alone database instance. You can create and modify a DB instance by using the Amazon RDS command line interface, the Amazon RDS API, or the AWS Management Console. Each DB instance runs a DB engine. 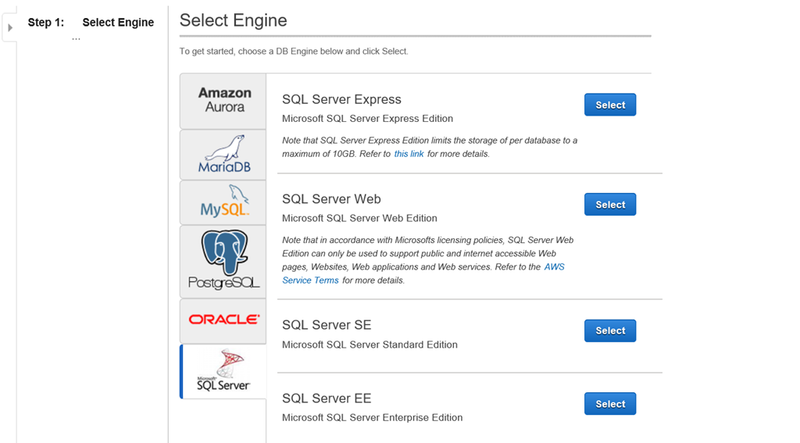 Amazon RDS currently supports the MySQL, PostgreSQL, Oracle, and Microsoft SQL Server DB engines. As per my background I will illustrate running DB instance of SQL Server in RDS here, but in the future I may venture further touching MySQL and especially its specialized Amazon cousin known as Aurora. The computation and memory capacity of a DB instance is determined by its DB instance class. 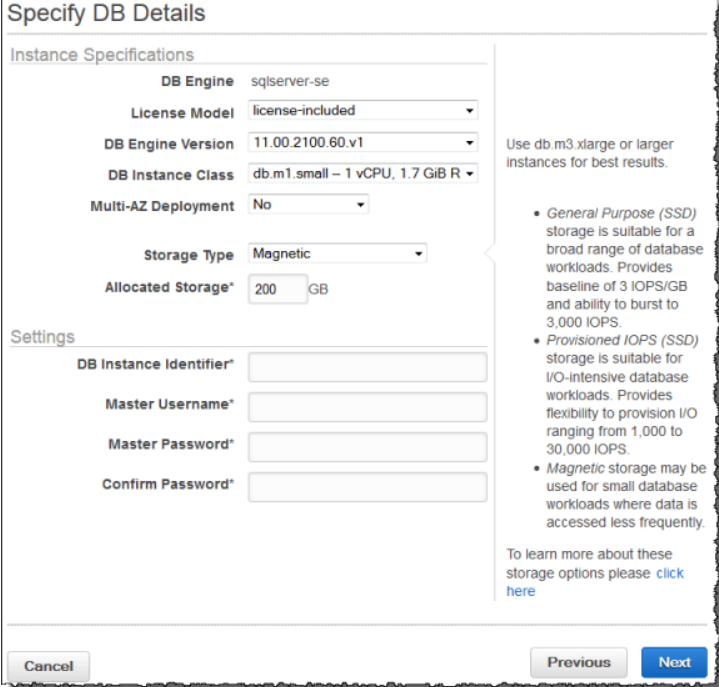 You can select the DB instance that best meets your needs. If your needs change over time, you can change DB instances. For each DB instance, you can select from 5 GB to 3 TB of associated storage capacity, instance storage comes in three types: Magnetic, General Purpose (SSD), and Provisioned IOPS (SSD). They differ in performance characteristics and price, allowing you to tailor your storage performance and cost to the needs of your database. Amazon cloud computing resources are housed in highly available data center facilities in different areas of the world (for example, North America, Europe, or Asia). Each data center location is called a region.Each region contains multiple distinct locations called Availability Zones, or AZs. Each Availability Zone is engineered to be isolated from failures in other Availability Zones, and to provide inexpensive, low-latency network connectivity to other Availability Zones in the same region. By launching instances in separate Availability Zones, you can protect your applications from the failure of a single location. You can run your DB instance in several Availability Zones, an option called a Multi-AZ deployment. When you select this option, Amazon automatically provisions and maintains a synchronous standby replica of your DB instance in a different Availability Zone. The primary DB instance is synchronously replicated across Availability Zones to the standby replica to provide data redundancy, failover support, eliminate I/O freezes, and minimize latency spikes during system backups. Amazon RDS supports DB instances running several editions of Microsoft SQL Server 2008 R2 and SQL Server 2012. Amazon RDS currently supports Multi-AZ deployments for SQL Server using SQL Server Mirroring as a high-availability, failover solution. Amazon also supports TDE (Transparent Database Encryption) feature in SQL Server , as well as allows SSL connections to your SQL Server instance as necessary. In order to deliver a managed service experience, Amazon RDS does not provide shell access to DB instances, and it restricts access to certain system procedures and tables that require advanced privileges. 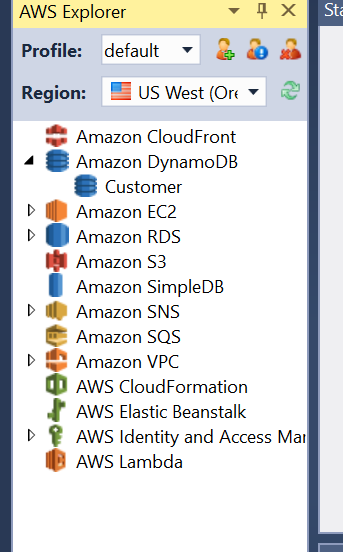 Amazon RDS supports access to databases on a DB instance using any standard SQL client application such as Microsoft SQL Server Management Studio. Amazon RDS does not allow direct host access to a DB instance via Telnet, Secure Shell (SSH), or Windows Remote Desktop Connection. When you create a DB instance, you are assigned to the db_owner role for all databases on that instance, and you will have all database-level permissions except for those that are used for backups (Amazon RDS manages backups for you). Obviously before you proceed you need to sign up for AWS account. You can do so here – https://aws.amazon.com/. 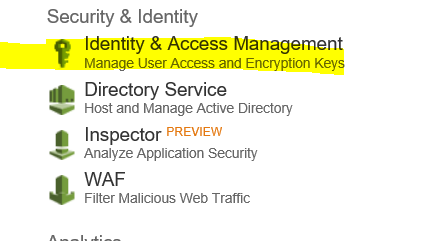 Next you should create IAM (Identity and Access Management) user. Once you log into AWS Console and go to IAM, as above. For Group Name, type a name for your group, such as RDS_Admios, and then choose Next Step. In the list of policies, select the check box next to the AdministratorAccess policy. You can use the Filter menu and the Search box to filter the list of policies. Choose Next Step, and then choose Create Group. In box 1, type a user name. Clear the check box next to Generate an access key for each user. Then choose Create. Select the check box next to your newly created admins group. Then choose Add to Groups. Scroll down to the Security Credentials section. Under Sign-In Credentials, choose Manage Password. Select Assign a custom password. Then type a password in the Password and Confirm Password boxes. When you are finished, choose Apply. I will pick SQL Server from available DB Instance types. Here also I can pick my DB Instance Class. Instance classes are detailed in Amazon docs here – http://docs.amazonaws.cn/en_us/AmazonRDS/latest/UserGuide/Concepts.DBInstanceClass.html. I am picking a very small testing instance , what Amazon calls micro instance size – an instance sufficient for testing that should not be used for production applications. After adding some more info including Availability Group, Backup preferences and retention I can hit Create Instance button. Use that instance string and your user name to connect. Azure Redis Cache is a distributed, managed cache that helps you build highly scalable and responsive applications by providing faster access to your data. 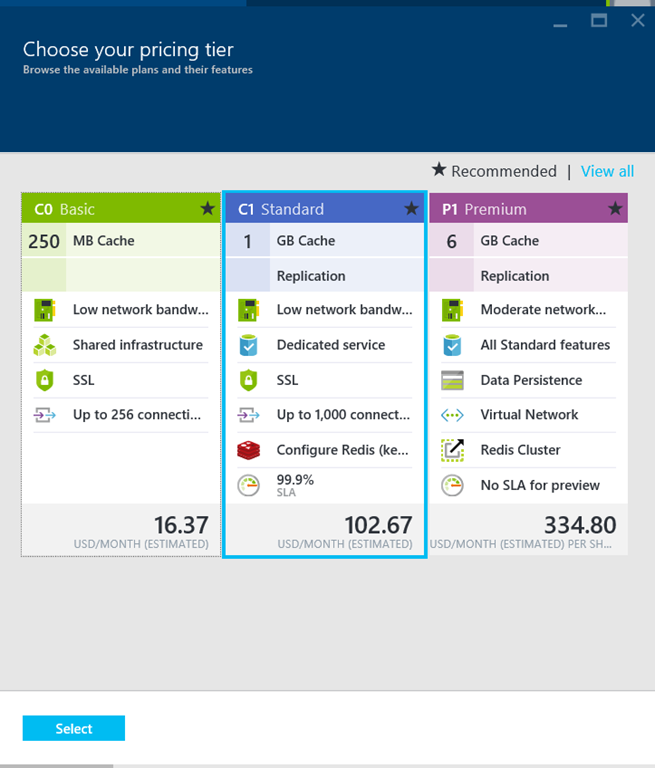 I blogged quite a lot previously on Redis and its features here – https://gennadny.wordpress.com/category/redis/ and on Azure Redis PaaS offering here – https://gennadny.wordpress.com/2015/01/19/forecast-cloudy-using-microsoft-azure-redis-cache/. The new Premium tier includes all Standard-tier features, plus better performance, bigger workloads, disaster recovery, and enhanced security. Additional features include Redis persistence, which allows you to persist data stored in Redis; Redis Cluster, which automatically shards data across multiple Redis nodes, so you can create workloads using increased memory (more than 53 GB) for better performance; and Azure Virtual Network deployment, which provides enhanced security and isolation for your Azure Redis Cache, as well as subnets, access control policies, and other features to help you further restrict access. To me a huge disappointment for Redis on Windows (MsOpenTech Redis) and Azure has been inability to scale out across nodes and news of Azure Redis Cluster are particularly welcome. Redis Cluster provides a way to run a Redis installation where data is automatically sharded across multiple Redis nodes. Redis Cluster also provides some degree of availability during partitions, that is in practical terms the ability to continue the operations when some nodes fail or are not able to communicate. However the cluster stops to operate in the event of larger failures (for example when the majority of masters are unavailable). So in practical terms, what you get with Redis Cluster? The ability to continue operations when a subset of the nodes are experiencing failures or are unable to communicate with the rest of the cluster. Node A contains hash slots from 0 to 5500. Node B contains hash slots from 5501 to 11000. Node C contains hash slots from 11001 to 16384. This allows to add and remove nodes in the cluster easily. For example if I want to add a new node D, I need to move some hash slot from nodes A, B, C to D. Similarly if I want to remove node A from the cluster I can just move the hash slots served by A to B and C. When the node A will be empty I can remove it from the cluster completely. Because moving hash slots from a node to another does not require to stop operations, adding and removing nodes, or changing the percentage of hash slots hold by nodes, does not require any downtime. Redis Cluster is not able to guarantee strong consistency. In practical terms this means that under certain conditions it is possible that Redis Cluster will lose writes that were acknowledged by the system to the client. Your client writes to the master A. The master A propagates the write to its slaves A1, A2 and A3. As you create your Redis Premium you can specify number of cluster nodes\shards as well, as well as persistence model for the first time! Now I can access this cluster just like I accessed single Redis instance previously. My next steps are dig into Azure Redis Cluster deeper so stay tuned for updates. In-Memory OLTP tables come in two flavors – durable and non-durable. Durable are default type. The schema of the durable table is stored in the system database in primary file group, just like the regular tables. The data are stored in the MEMORY OPTIMIZED DATA file group. Creating a memory optimized durable table is simple. You can use the regular table creation script with MEMORY_OPTIMIZED=ON table option to create a durable table. Once the SQL Server 2014 is restarted, the data in the durable table is loaded to the memory. the online transaction processing is done on the data loaded to the memory. So important to note that durable tables provide for data durability between restarts. Non-durable tables. Just like the durable table, the schema of the non-durable table is stored in the system database in the physical disc. But, contrary to the durable table, Non-Durable table’s data are stored in the memory alone. So during a server crash or restart, all the data stored in the non-durable table will be lost. Thus the non-durable table acts like a permanent table with temporary data. Customer was working with durable tables. 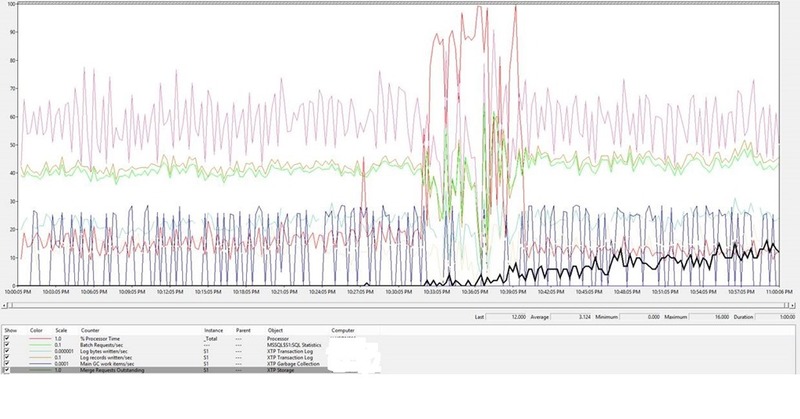 What really caused an issue here is extremely slow disk IO subsystem configuration on VMware platform hosting this SQL Server instance, after all why care for disk performance when you are In-Memory? Not so fast. Enter Data Merge in Durable In-Memory OLTP. The data for memory optimized tables is stored in one or more data/delta file pairs (also referred to as checkpoint file pairs or CFP) with data file(s) storing inserted rows and delta file(s) referencing deleted rows. During the execution of an OLTP workload, as the DML operations update, insert, and delete rows, new data/delta files are created to persist the data. Also, existing delta files are updated to process delete of existing rows. Over time, if the number of active rows, after accounting for deleted rows, in two or more consecutive CFPs falls below a threshold (usually < 50%) such that they can be merged into one CFP of 128 MB, they are merged automatically by a background merge process into a new CFP. Once the merge operation is complete, the older CFPs go through a transition phase and are eventually removed (i.e. garbage collected) from the storage. SQL Server 2014 supports up to 8192 CFPs within a database. The Merge operation takes one or more closed CFPs, called MERGE SOURCE(s), based on an internally defined merge policy, described later, and produces one resultant CFP, called MERGE TARGET. The entries in each delta file of source CFP(s) are used to filter rows from the corresponding data file to remove the data rows that are not needed anymore. The remaining rows in the source CFPs are consolidated into one target CFP. After the merge is complete, the resultant CFP (i.e. the merge-target) replaces the source CFPs (i.e. the merge sources). The merge-source CFPs go through a transition phase before they are eventually removed from the storage. After accounting for the storage taken by CFPs in various states, the overall storage taken by durable memory-optimized tables can be much larger than 2x. The DMV sys.dm_db_xtp_checkpoint_files can be queried to list all the CFPs in memory-optimized file group including the phase they are in. Transitioning CFPs from MERGE_SOURCE state to TOMBSTONE and ultimately getting garbage collected can take up to 5 checkpoints and transaction log backup, if database is configured for full or bulk-logged recovery model, steps. You can, of course, manually force the checkpoint followed by log backup to expedite the garbage collection but then this will add 5 empty CFPs (i.e. 5 data/delta file pairs with data file of size 128MB each). Merge Requests Outstanding counter tracks number of merge requests outstanding since the server started. Note that previous to CPU spike these were at 0 and then we started climbing. That points that perhaps our Disk IO subsystem doesn’t keep up with Hekaton MERGE activities on the disk, mainly perhaps writes to destination MERGE file. Performing the merge for the checkpoint file containers. Recovery in the case of service failure. 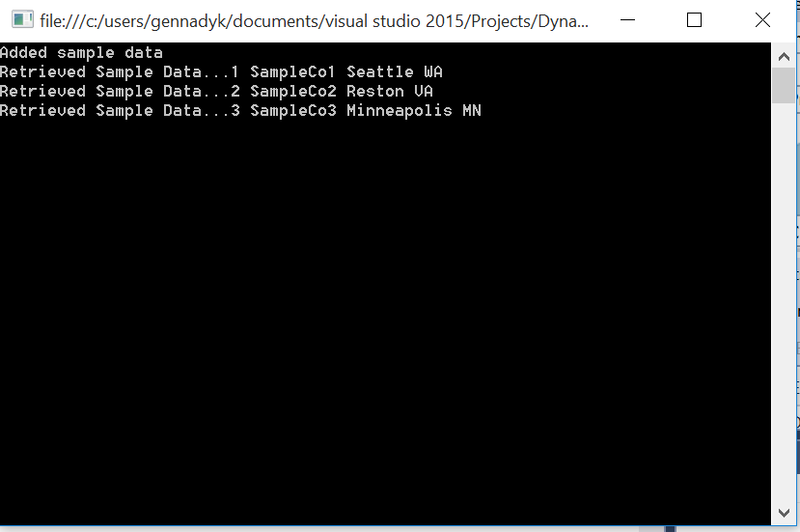 This will load the containers, via streaming I/O, which loads the files into memory and recreates the table. Reads from source files participating in merge operations. Writes to the destination merge file. For more information regarding the data and delta files and checkpoints, see “Durability for Memory-Optimized Tables” (http://msdn.microsoft.com/en-us/library/dn553125(v=sql.120).aspx) and “Checkpoint Operations for Memory-Optimized Tables” (http://msdn.microsoft.com/en-us/library/dn553124(v=sql.120).aspx). As you may be aware SQL Server 2016 is coming soon and SQL Server 2016 Community Technology Preview 2.4 is available for download here. 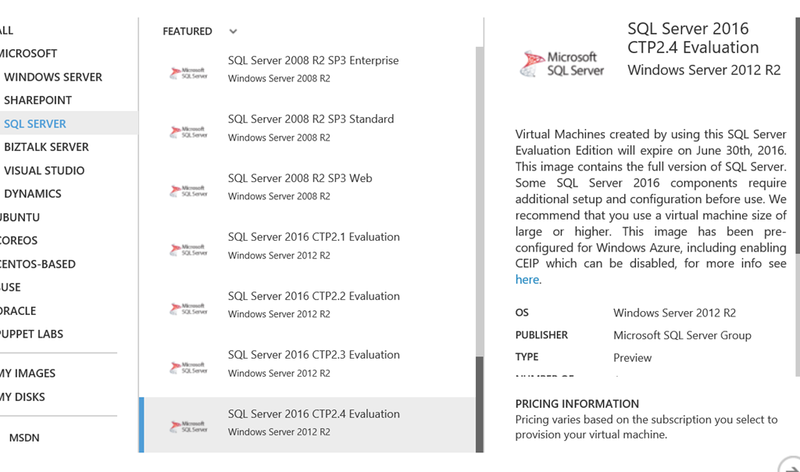 http://www.microsoft.com/en-us/server-cloud/products/sql-server-2016/. This release is coming with plethora of new advanced features, one of which is Query Store. 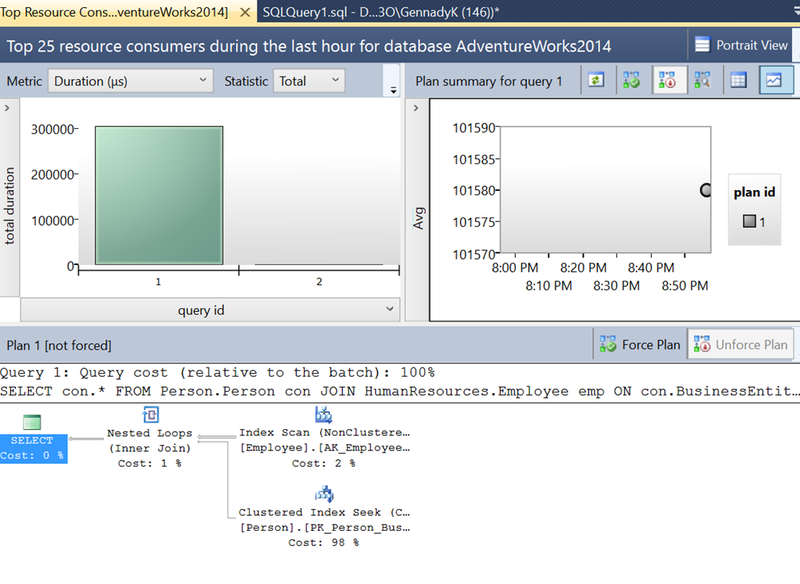 Have you ever seen execution plan regressions after SQL Server upgrade? What about after release of new code? If so this feature can be of great help for you. 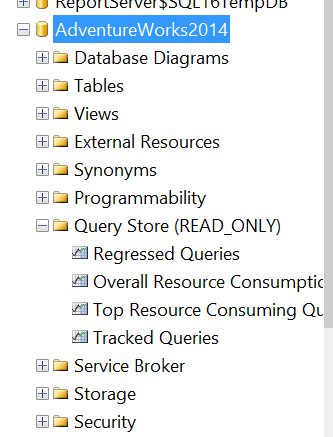 Cannot perform action because Query Store is not started up for this database. Once the Query Store is enabled, it will start collecting the plans and query performance data and you can analyze that data by looking at the Query Store tables. Now this query is elemental, but assuming there was really something to tune here, outside of using wildcard ( *) , which is always a bad practice or something to index we could add an index and then rerun , comparing both plans via Query Store. In case of upgrade optimizer issue we can force a particular plan via plan guide in worst case scenario as well. Now lets get query tuning…. 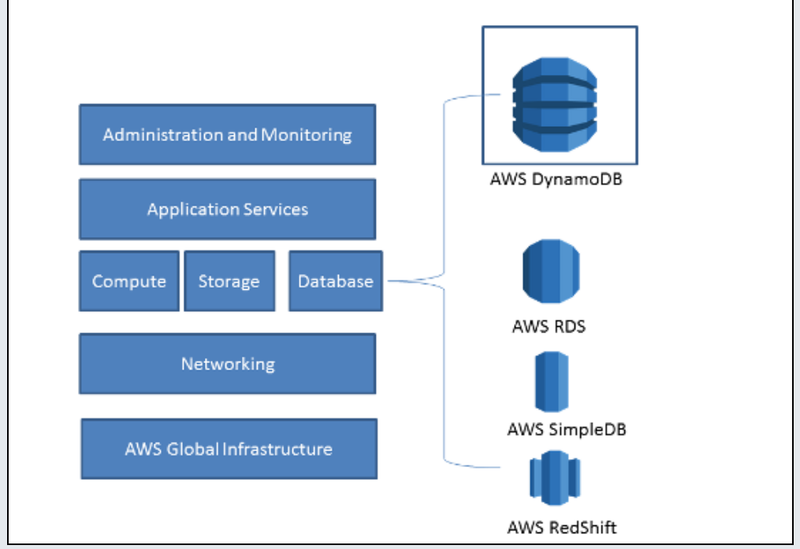 Amazon DynamoDB is AWS primary NoSQL data storage offering. Announced on January 18, 2012, it is a fully managed NoSQL database service that provides fast and predictable performance along with excellent scalability. DynamoDB differs from other Amazon services by allowing developers to purchase a service based on throughput, rather than storage. Although the database will not scale automatically, administrators can request more throughput and DynamoDB will spread the data and traffic over a number of servers using solid-state drives, allowing predictable performance. It offers integration with Hadoop via Elastic MapReduce. The above diagram shows how Amazon offers its various cloud services and where DynamoDB is exactly placed. 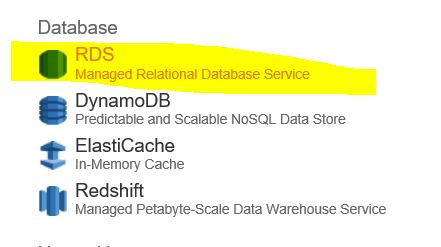 AWS RDS is relational database as a service over Internet from Amazon while Simple DB and DynamoDB are NoSQL database as services. Both SimpleDB and DynamoDB are fully managed, non-relational services. DynamoDB is build considering fast, seamless scalability, and high performance. It runs on SSDs to provide faster responses and has no limits on request capacity and storage. It automatically partitions your data throughout the cluster to meet the expectations while in SimpleDB we have storage limit of 10 GB and can only take limited requests per second. Also in SimpleDB we have to manage our own partitions. So depending upon your need you have to choose the correct solution. The low-level programming model wraps direct calls to the DynamoDB service.You access this model through the Amazon.DynamoDBv2 namespace. Of the three models, the low-level model requires you to write the most code. The document programming model provides an easier way to work with data in DynamoDB. This model is specifically intended for accessing tables and items in tables.You access this model through the Amazon.DynamoDBv2.DocumentModel namespace. Compared to the low-level programming model, the document model is easier to code against DynamoDB data. However, this model doesn’t provide access to as many features as the low-level programming model. For example, you can use this model to create, retrieve, update, and delete items in tables. The object persistence programming model is specifically designed for storing, loading, and querying NET objects in DynamoDB.You access this model through the Amazon.DynamoDBv2.DataModel namespace. We will start by navigating to AWS console and creating a table. For the sake of easy tutorial I will create a table customer with couple of fields. Here I have to think about design of my table a little, in particular around hash and range keys. 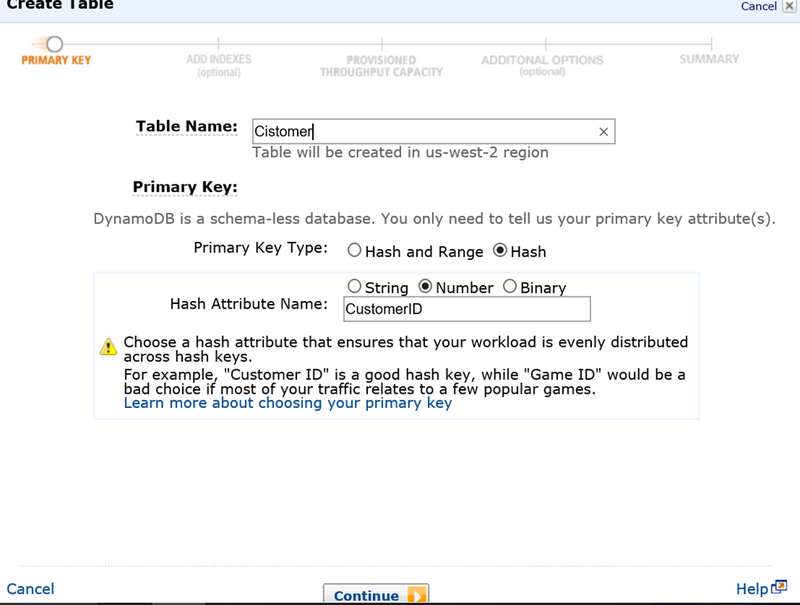 In DynamoDB concept of “Hash and Range Primary Key” means that a single row in DynamoDB has a unique primary key made up of both the hash and the range key. Hash Primary Key – The primary key is made of one attribute, a hash attribute. For example, a ProductCatalog table can have ProductID as its primary key. DynamoDB builds an unordered hash index on this primary key attribute. This means that every row is keyed off of this value. Every row in DynamoDB will have a required, unique value for this attribute. Unordered hash index means what is says – the data is not ordered and you are not given any guarantees into how the data is stored. You won’t be able to make queries on an unordered index such as Get me all rows that have a ProductID greater than X. You write and fetch items based on the hash key. For example, Get me the row from that table that has ProductID X. You are making a query against an unordered index so your gets against it are basically key-value lookups, are very fast, and use very little throughput. 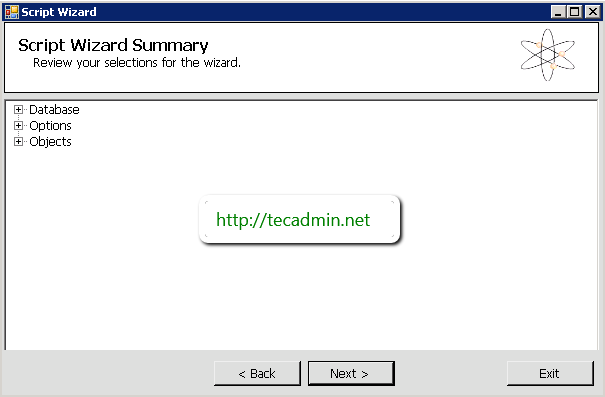 After finishing Create Table Wizard I can now see my table in the console. Local Secondary Indexes consume throughput from the table. When you query records via the local index, the operation consumes read capacity units from the table. When you perform a write operation (create, update, delete) in a table that has a local index, there will be two write operations, one for the table another for the index. Both operations will consume write capacity units from the table. Global Secondary Indexes have their own provisioned throughput, when you query the index the operation will consume read capacity from the table, when you perform a write operation (create, update, delete) in a table that has a global index, there will be two write operations, one for the table another for the index*. Important Documentation Note: In order for a table write to succeed, the provisioned throughput settings for the table and all of its global secondary indexes must have enough write capacity to accommodate the write; otherwise, the write to the table will be throttled.